The systematic and deliberate large scale engineering and manipulation of the planetary environment, ecosystem and all living creatures and life forms therein. 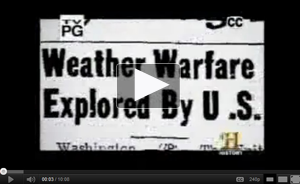 For many years the U.S. government (Military) has documented its intent to manipulate the weather using planes. Videos and documents exist to support this conclusion. Hundreds of patents have been obtained, experiments conducted, meetings held to discuss the issue, even documentaries shown explaining what they are doing, how far they've come with it and where they hope to go with it. Government agencies and the military have even released documents outlining exactly what they have in mind and how they intend to do it. This much is not debatable. Certain things we know and others we can only speculate on. Since noticeable spraying began, (some have it at some point in the late 1990's) environmental activists responded to this new and unusual disfiguring of the skies by asking the usual questions. What are those lines in the sky disfiguring the blue skies?? What are they spraying? Why are they spraying us? When will it stop? Is this even ethical? Who authorized this ongoing spraying?? Why are our politicians not willing to address this issue?? These questions went unanswered for years. Shortly after the movement picked up it was clear what direction government (under Obama) was going in defense of their weather modification programs and global geoengineering. It looks as though rogue elements in our government made a decision to simply deny that the programs exist. The denial card would be the best way to handle the issue to get the most accomplished in the shortest amount of time. And with that, the chemtrails "conspiracy theory" was born. Keep in mind the alternate option for government would have been something similar to what we currently see with the battle for GMO foods or vaccine safety. No one claims these are conspiracies. Everyone agrees it's happening, foods are genetically modified and vaccines do have Mercury and other metal toxins in them, so the globalist have a much different and difficult battle in their hands with these issues. They need to constantly battle the facts about these topics and they are constantly being embarrassed, in some cases by children on these issues. The chemtrails "conspiracy" however, would prove a very different game. Everyone can see the trails in broad daylight so the only chance to maintain the program would be through repetition of lies and hard propaganda, total secrecy, and constant denial. This deep state agenda is entirely wedged in denial while at the same time they face the challenge of having to roll out chemtrails to the general public. For this they will need to ride on the Global Warming lie (think deep state, think globalist). At least that seems to be their long term game plan as of now. Ironically, government scientists and military have not only for decades acknowledged these geoengineering programs but even today they actually still admit to them. It turns out (by observation) the process and promotion of denying these programs (like a denial operation) seems to have been delegated to politicians, key government mouthpieces and an army of mysterious online trolls and shills. Is any of this starting to make sense? Welcome to the "Chemtrails" movement. 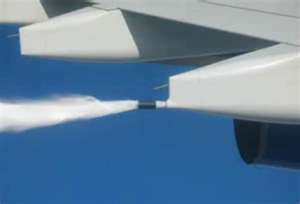 Chemical spraying programs are long exposed, here you can appreciate several of the types of spraying mechanisms mounted on the planes that are used for these crimes. 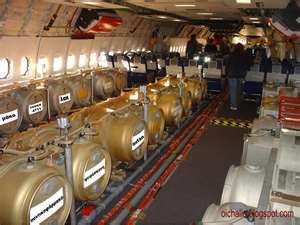 Additionally, additives and chemical concoctions can be added to jet fuel to get their geoengineered chemical results. Now we are seeing so called 'chem-bombs' released into the stratosphere whose method of delivery is unknown. Understanding how blatant these crimes are, one can see the tactics they use to keep the these programs operating in secret. 1. We know that spraying programs are being conducted world-wide because we can see the trails all over the world. 3. Thanks to GeoEngineer David Keith, we know they (the deep state) have wanted to introduce the programs overtly after years of covertly operating, under the guise of helping with Global Warming. Coincidence? 4. During the Obama years elements in the government were aware of the spraying programs as demonstrated by various whistleblower accounts. 6. We know that individuals supporting these spraying programs try to diminish and downplay the concerns people may have about the metal toxicity to humans even as doctors warn of the dangers of these metals to humans. 7. We suspect that some of the metals in the chemical sprays may include but are not limited to Barium, Aluminum, Strontium, Silver Iodide (which they use to create rain), and various other metals. More studies with clear results and definitive results need to be done to prove this. 8. We know that the US military defense contractor Hugh Aircraft Company has a patent for seeding weather modification chemtrails containing the Welsbach formula ingredients, and we know this is one of many other patents obtained by government and private government contractors. Is this direct evidence? No, but should raise concerns and interest. 10. 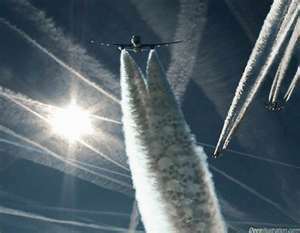 In the past it appears that spraying programs involved both the military and private companies that stood to gain by having personal investment in the manipulation and control of the weather. Today it is unclear if rogue elements in the US Military are still cooperating with these programs or is it all privately operated. As mentioned before, we know that these programs are global and suit the agenda of the globalists. 13. Chemtrails is a big topic and it involves the environment, so why does the Left/Dems not resist and expose this 24/7 like they do other environmental issues??? We believe this is because all spraying programs are globalist operations very likely related to globalization and depopulation of the planet in terms of both human life and animals. 14. I absolutely hope and believe we will see an end to these sky spraying programs under the Trump era as all globalist criminal operations are being taken down systemmatically. Profit is not worth the cost of lives. 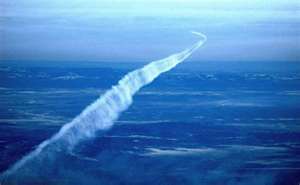 I do not believe that will end "ALL" spraying programs as I believe the US Military will continue to conduct weather operations in an effort to maintain superiority over the enemy KNOWING that if they don't do this then the enemy WILL. 15. I also believe we (the people) will finally get to the bottom of these programs (think Darkness to Light) including finding out what the degree of danger is in these programs and what EXACTLY is in the visible trails we see. Tracking Chemtrails Spraying in LA for 61 Days, See Results!